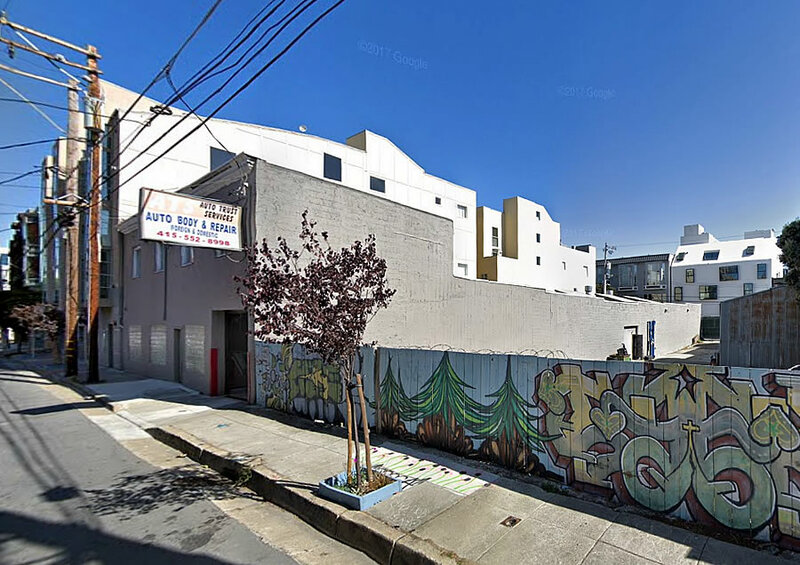 In the works since 2016, plans to level the two-story Auto Trust Services building at 255 Shipley Street and develop a modern four-story building upon its Western SoMa site could be approved on August 23. As initially designed and recently refined by Stanley Saitowitz | Natoma Architects, the development would stretch from Shipley to Clara, with 24 residential units over 4,400 square feet of half-sunken Production, Distribution and Repair (PDR) space and the entrance to a five-car garage at the base of the development along Clara Street with an internal courtyard and pedestrian bridges between. 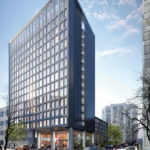 And as newly rendered above and below, the ground floor façade of the development would be finished with Porcelanosa building panels, above which laminate resin panels would be hung. 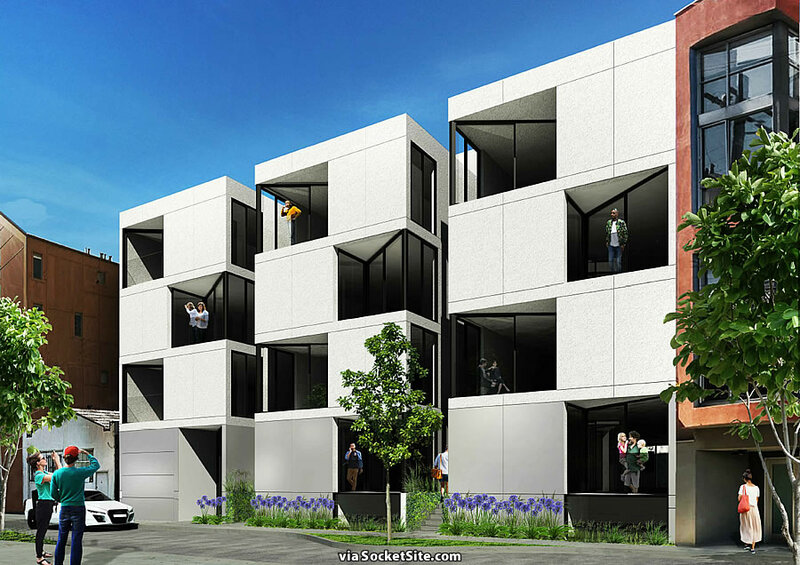 In addition to creating little outdoor spaces, the angled window design is intended to “increase the number of eyes on the street.” And if approved and built, three (3) of the units are slated to be rented at below market rates. why BMR rentals? Did they get some sort of density bonus or is this owned by a non profit? Since it’s over 9 units — but less than 25 — either you pay the Inclusionary Housing Fee or provide 12% of the dwellings as BMR units, i.e., 2.88 units; round up to 3. 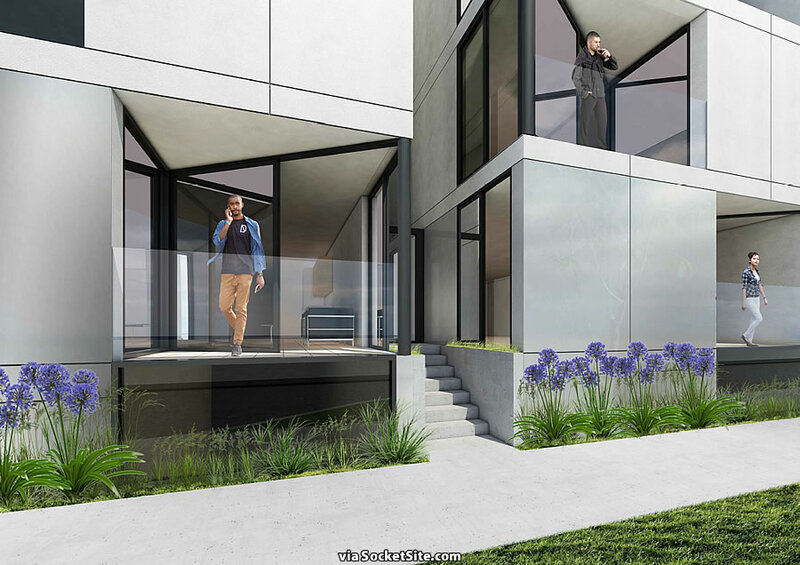 That’s the strangest rendering of the occupants standing their decks. It is reminiscent of a prison block(*) right before the warden pulls the lever to open the cell doors. The lowest two people in the bottom picture looks like they’re trying to walk through their respective windows. But that’s nothing. The top person in the middle picture has no legs. I was imagining some kind of riot occurring outside. Or maybe one of The Lost is having an episode in the middle of the street? 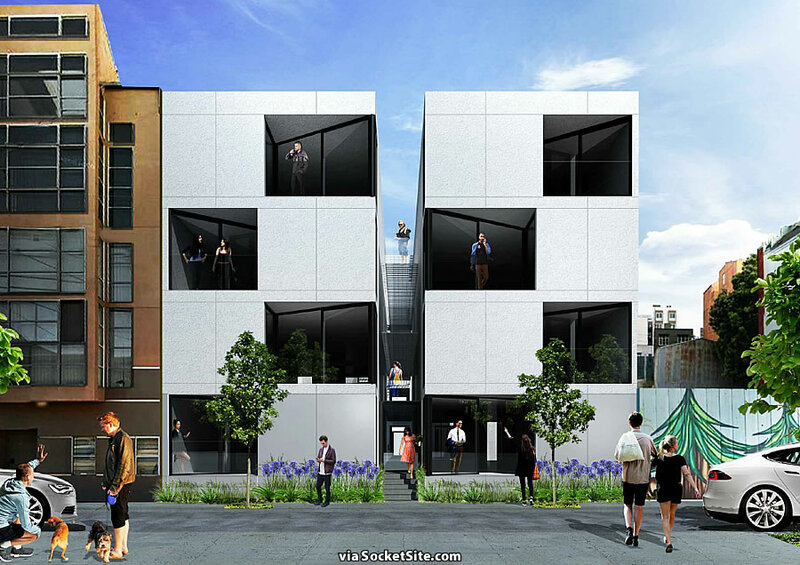 Famous architects are now building interesting, expensive luxury buildings on a service alley. For most of its life, I imagine, this street was used for “tenement” housing and back entrances for repair shops. There are many people who are dismayed by the current housing market, but there are hundreds of visible indicators –not to mention statistics– that things will never go back. Prices may level off, building may slow, inflation may erode the buying power of currency, but the changes are real and permanent. We have witnessed a reordering of SF equal to Haussmann’s in Paris from 1850 to 1870. We’ve seen housing prices plummet without huge amounts of new stock coming online (i.e. during the recession). Broader economic trends can definitely force prices down on their own. That’s not a good thing to rely on, but it is possible and has happened before. How much did they plummet in the core Bay Area, though? Much of the pain occurred in outer suburbs like Solano County or the commuter belt in S.J County? If climate change is real and the summers become even more unbearable (July sucked! ), and the jobs market softens, I still imagine the biggest pain will be in places like Manteca. Back in the day I definitely used this alley as a back entrance. Exactly! I think it would be appropriate to have Edvard Munch’s “The Scream” facing out of one of the windows. This design will not age well. Not a huge fan of Saitowitz designs. I see his building at 8 Octavia and the group of panhandlers on the median and wonder how the building residents feel about living so close to the freeway on/off ramps. To each their own. He does have a particular style. Drove by a Saitowitz building on Divisadero yesterday and the panels are already coming off, there are gaps forming by the windows, and the weather staining makes it look like it was built in the 80s and never cleaned. And on the topic of 8 Octavia. The Market St elevation looks nearly identical to the Oakland Jail. I am not sure why there is so much demand for his cold and lifeless designs. Nice design. I wonder what the interior will be like. I think it looks great. SF has so few interesting residential buildings for a city of it’s prominence. 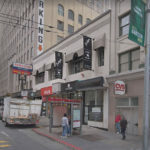 This building would be right across from another Saitowitz development on Clara Street (the white building visible in the background of the topmost photo). Would be cool to have 2 buildings by the same architect framing Clara.